This web page summarizes the GOES (Geostationary Operational Environmental Satellite) DCS system. Much of this information is extracted directly from the NOAA websites whom we link to on our links page. More detailed information is available on those pages. The National Environmental Satellite, Data, and Information Service (NESDIS), part of The National Oceanic and Atmospheric Administration (NOAA), manages, operates, and maintains the U.S. Geosynchronous GOES system which consists of two meteorological satellites in geostationary orbit over the equator. Each satellite views almost a third of the Earth's surface: one monitors North and South America and most of the Atlantic Ocean, the other North America and the Pacific Ocean basin. GOES-8 (or GOES-East) is positioned at 75 W longitude and the equator, while GOES-10 (or GOES-West) is positioned at 135 W longitude and the equator. The two operate together to produce a full-face picture of the Earth, day and night. Coverage extends approximately from 20 W longitude to 165 E longitude. 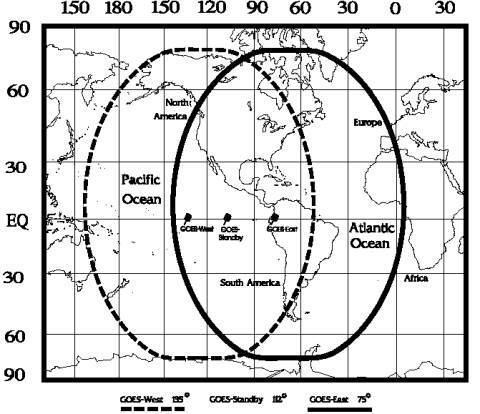 This figure shows the coverage provided by each satellite. The GOES system’s primary mission is to continuously observe changing weather phenomena from satellite-based sensors situated approximately 23,000 miles from Earth. The GOES also supports an environmental data satellite radio relay DCS mission. 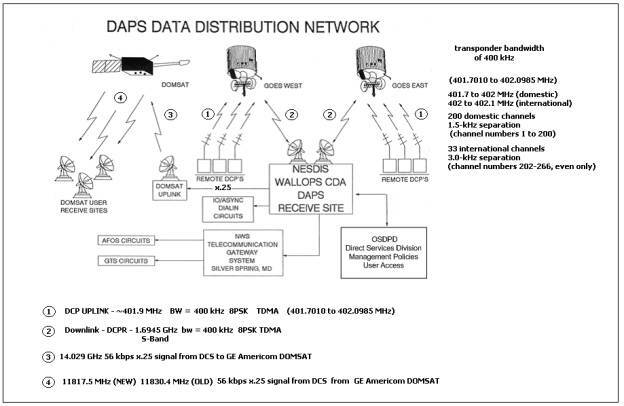 The DCS allows a remote radio set or Data Collection Platform (DCP), which is land, sea, or mobile based, to transmit through the GOES and back to the NESDIS Wallops Command and Data Acquisition Station (WCDAS) at Wallops, Virginia. Currently, two GOES satellites - one in the East and one in the West - are used to support DCS mission requirements. From WCDAS, this data is selectively routed to the appropriate system users via communications links including Domestic satellite (DOMSAT), National Weather Service Telecommunications Gateway (NWSTG), the Internet and dial-up telnet access. User resource allocation and administration are conducted at the NESDIS Suitland Federal Center in Suitland, Maryland, via workstations connected to the DCS. 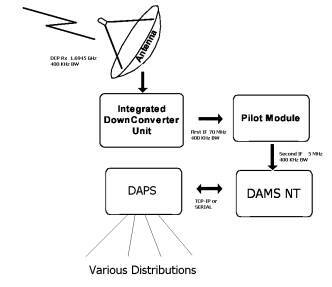 The composite signal is down converted to a nominal 70 MHz IF which is down converted a second time to 5 MHz composite IF and fed to the original DAMS-NT, where the messages are demodulated, checked for data quality, and formatted for input to the DAPS computer system.